Hypertension is usually associated with deficient nitric oxide (NO) bioavailability, and therefore stimulating NO activity is an important antihypertensive strategy. Recently, many studies have shown that both nitrite and nitrate anions are not simple products of NO metabolism and indeed may be reduced back to NO. While enzymes with nitrite-reductase activity capable of generating NO from nitrite may contribute to antihypertensive effects of nitrite, another mechanism involving the generation of NO-related species in the stomach from nitrite has been validated. Under the acidic conditions of the stomach, nitrite generates NO-related species that form S-nitrosothiols. Conversely, drugs that increase gastric pH may impair the gastric formation of S-nitrosothiols, which may mediate antihypertensive effects of oral nitrite or nitrate. Therefore, it is now becoming clear that promoting gastric formation of S-nitrosothiols may result in effective antihypertensive responses, and this mechanism opens a window of opportunity in the therapy of hypertension. 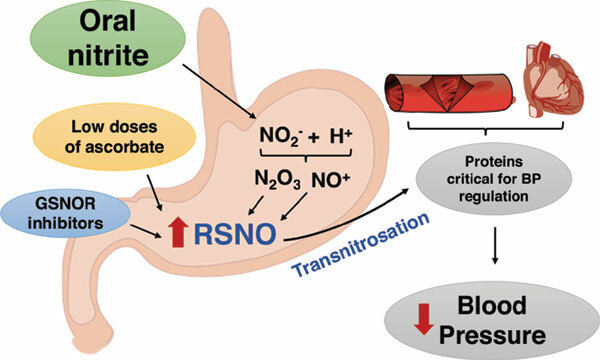 In this review, we discuss the recent studies supporting the gastric generation of S-nitrosothiols as a potential antihypertensive mechanism of oral nitrite. We also highlight some drugs that increase S-nitrosothiols bioavailability, which may also improve the responses to nitrite/nitrate therapy. This new approach may result in increased nitrosation of critical pharmacological receptors and enzymes involved in the pathogenesis of hypertension, which tend to respond less to their activators resulting in lower blood pressure. Keywords: Hypertension, nitric oxide, nitrite, S-nitrosation, S-nitrosothiols, oral nitrite. Keywords:Hypertension, nitric oxide, nitrite, S-nitrosation, S-nitrosothiols, oral nitrite. Abstract:Hypertension is usually associated with deficient nitric oxide (NO) bioavailability, and therefore stimulating NO activity is an important antihypertensive strategy. Recently, many studies have shown that both nitrite and nitrate anions are not simple products of NO metabolism and indeed may be reduced back to NO. While enzymes with nitrite-reductase activity capable of generating NO from nitrite may contribute to antihypertensive effects of nitrite, another mechanism involving the generation of NO-related species in the stomach from nitrite has been validated. Under the acidic conditions of the stomach, nitrite generates NO-related species that form S-nitrosothiols. Conversely, drugs that increase gastric pH may impair the gastric formation of S-nitrosothiols, which may mediate antihypertensive effects of oral nitrite or nitrate. Therefore, it is now becoming clear that promoting gastric formation of S-nitrosothiols may result in effective antihypertensive responses, and this mechanism opens a window of opportunity in the therapy of hypertension. In this review, we discuss the recent studies supporting the gastric generation of S-nitrosothiols as a potential antihypertensive mechanism of oral nitrite. We also highlight some drugs that increase S-nitrosothiols bioavailability, which may also improve the responses to nitrite/nitrate therapy. This new approach may result in increased nitrosation of critical pharmacological receptors and enzymes involved in the pathogenesis of hypertension, which tend to respond less to their activators resulting in lower blood pressure.